Walking the golf course can be a fun and rewarding exercise experience for you that can get you in great shape compared to driving a golf cart around and walking a minimal distance. However, walking can go from rewarding to penalizing fast if you don’t have the right bag. For me, carrying my bag on one shoulder while it tore apart and weighed several pounds only made life hell by the time I hit the 18th hole. I shopped around and decided to give the Cleveland CG Stand Bag a chance in hopes of playing golf and walking enjoyable again for me. I’ll be honest with you, I felt like I was walking around school with a backpack on my shoulders. It was a pleasant experience compared to what I had. The Cleveland CG Bag is not very heavy at all. It weighs six pounds, which is a little heavier than some of the other new bags that have come out, but it also has a lot more storing room for you. It has 14 dividers and the ability to store everything from beer to shoes and umbrellas. It even has a large, insulated cooler pocket. It has six zippered bags included. It has a dual strap which makes walking much more comfortable than the bag I used to have that had just one strap. It makes carrying it much easier, especially when it’s only 6 pounds. The straps are also very durable and very comfortable, with extra padding on them. It has a molded three-way grab handle for when you pick up the bag. One recommendation is the handles could be a little softer. They are a bit harder compared to some of the other bags I’ve carried. Are you one of those golfers who has 20+ clubs in their bags? Well, the stand itself is very sturdy and can handle a lot of clubs in there at once so don’t worry about it being too heavy for it. The only part of the bag that could be sturdier would be the rain cover on the bag. It’s a big light and can get damaged easily if you’re not careful. Could be tough in the heavy Florida rains. Drain holes are also unavailable with this bag. The bag has a 6-way top with full length club dividers to give your clubs a lot of extra room in the bag, depending on how many you carry. This makes it convenient for storing the clubs. However, one area that can be a nuisance is it does require some extra time and effort to put the clubs in the dividers. The bag also has custom grip leg end caps which are great for putting it in a pull cart. It also contains a leg containment strap for keeping the bag secure when riding. The bottom of the bag is very sturdy and tough so you don’t have to worry about it falling off the cart. The legs on The cleveland CG are quite durable and you don’t need to worry about the bag falling over. What’s neat is the technology this bag comes with. I mean air vents! These air vents are used for the apparel pockets along the side. Overall, this bag has so many different compartments and pockets for so many different things. We mentioned earlier you can fit a cooler in there with your water or beer. It has pockets for balls, tees, insulated beverages, food, maps and all sorts of things. It has Velcro patches to make grabbing your glove easy. It’s a very classy looking bag. I love the colors on my bag of black, white and blue, but you can also get red, white and black or just black and white; whichever you prefer. The fabric is also very impressive and nice. Price-wise, it’s not bad. You can get it from $100-$150 at a lot of places. Amazon has it right now for $139.95. I am one of those guys who believe anything over $150 is asking way too much for a golf bag, no matter how many features it has. So it’s in my ballpark. Overall, it is one of the nicer bags I’ve come across. From the design of it to the feel of it, it makes golf classy. It makes walking a pleasure. You won’t come home suffering from back pain or have shoulder blisters. Not to mention, all the pockets and compartments allow you to bring all sorts of things with you to the golf course. 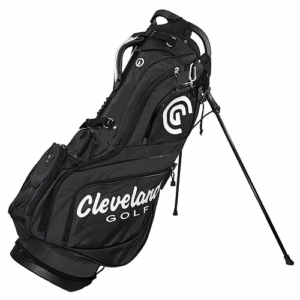 I highly recommend the Cleveland GC Golf Stand Bag. If you’re looking for something top notch and fancy, this is it.